"I thought, 'Oh, they're going to think there are a lot fewer people than were here,' " Zucker said. "Because underneath that grandstand, people were shopping during the race, they were at concession stands. In terms of numbers, we hit all our goals and are really pleased." California Speedway president Gillian Zuck quoted as she was surveying the empty grandstands. No Gillian we weren't thinking that at all. We were actually thinking "oh gee, all of those people look mysteriously like empty seats. Wait a minute are we at a NFL Football game in Los Angeles? Read the full story in: USATODAY.com - California officials: No sellout, no big deal. 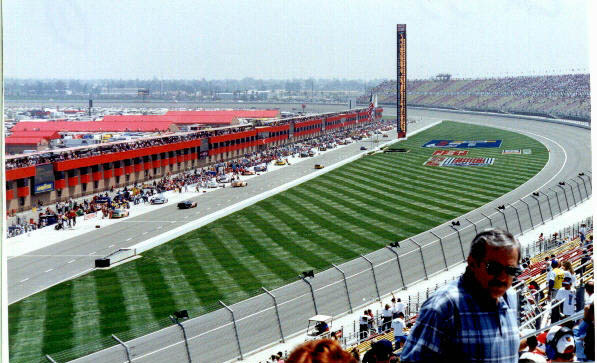 Race organizers have been busy organizing the fan festivites for Sundays race at California Speedway, according to the Fontana Herald News. Dale Earnhardt Jr. will be a part of the opening festivities and access to a meet-and-greet is being auctioned off by radio station KFRG. A Jeff Gordon meet-and-greet will also be auctioned, with all proceeds going to the Children's Fund of San Bernardino County. KFRG will also auction off one ride with NASCAR Nextel Cup Series champion Kurt Busch on-air. The ride will feature four laps "Under the Lights" around California Speedway in a Richard Petty Driving Experience racecar during the Racefest. Organizers anticipate raising a significant amount of money, and expect Kurt Busch to have to pay the most. In what I anticipate will be the only post about Jewel ever written in the Pit Road Post, it has been announced she will perform as part of the FOX Pre Race show. It is rumored Jewel wanted to wait until the Fox Broadcast so she could avoid spending any time alone with Wally Dallenbach during Wally's World.